When we look at the cosmic microwave background we see both overly warm and overly cold spots. The warm spots grew into places with a lot of stuff; namely our modern galaxies. The cold spots grew into places without a lot of stuff; these are cosmic voids. While we have known for a long time that some clusters are denser than other clusters, we hadn’t fully realized just how empty and large those voids could be. New research combining existing data from the Very Large Array in New Mexico (the array of telescopes in the movie “Contact”) and the Wilkinson Microwave Anisotropy Probe has shown their may be a void a billion years across in the direction of the constellation Eridanus. The way they found this possible void is really neat science. 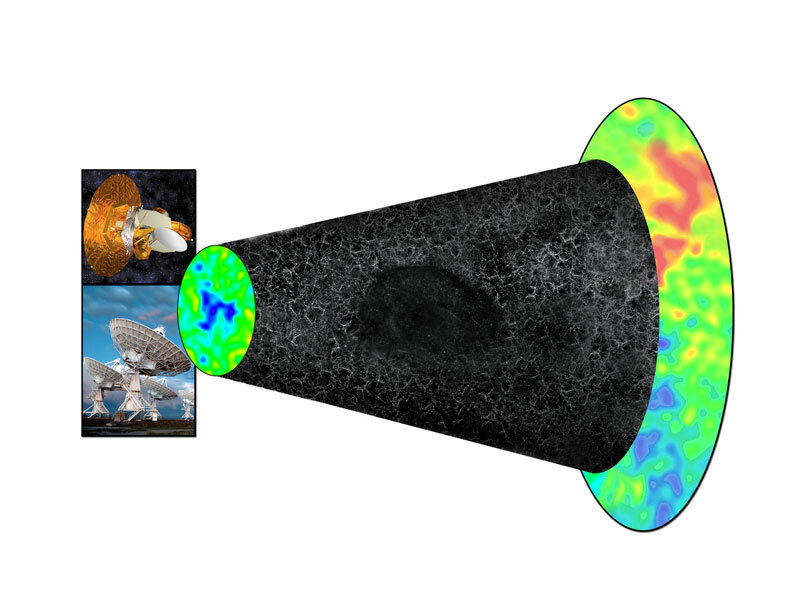 First they noted that there was a really cold spot in the CMB. This can mean two different things. It could simply mean the particular part of the universe that emitted those cosmic ray photons was actually anomalous, or, it could mean there is less stuff in that direction that is tweaking the light from the CMB. As the light comes through the universe, various interactions can increase the energy and wash out the details in the CMB. Without those secondary effects, we see a cold spot. To distinguish between the two cases, astronomers lead by Lawrence Rudnick Shea Brown and associate professor Liliya Williams (University of Minnesota) looked at the New VLA Sky Survey (NVSS) to see if the distribution of radio bright galaxies in that direction also indicated there was a void. And guess what – It did. There is simply nothing in NVSS in that direction.Â¬â€ By it self, the lack of radio sources in that region of the sky simply indicates there isn’t a lot of action going on in that part of space. Extragalactic radio sources fall into two broad categories: star forming galaxies (but these are generally fairly radio faint), and active galaxies (including Quasars). These active galaxies may have radio jets or appear as small centroids of radio brightness in radio maps of the sky. All these systems have actively feeding supermassive black holes in their centers. A void in radio galaxies alone only tells us there are no feeding supermassive black holes and no nearby star forming galaxies in that direction. While radio galaxies generally loosely trace the population of all galaxies, there are groups of galaxies out there without associated radio galaxies – this could have just been a huge batch boring space, or there could have been no galaxies to be traced by radio galaxies. By itself, either of these things don’t indicate anything really meaningfully exciting and at all conclusive. Put together, this points at a whole lot of nothing. It’s still not totally conclusive. I’d like to see some deep imaging that looks at gravitational lensing as a function of redshift to see if the void can be three dimensionally traced out. This would also nominally show of visible galaxies, creating a very empty deep field image. There is a lot of neat research that may be doable in this new void. Currently, even the most empty voids have a galaxy here or there inside of them. This void could have a whole bunch of very isolated stuff inside of it that we can study. Potentially, it will allow us to study the evolution of isolated objects over a billion years. While that is only ~1/14th of the age of the universe, that is still a fairly good chunk of time and space to explore. We know from our studies of Abell clusters what space looks like in the direction of the most dense objects, we know from the deep field images what space looks like in the direction of the most average chunks of space, and now we have the opportunity to explore the most diffuse areas of space. Is there a correlation on the sky between the NVSS catalogue and this one very cold spot? Yes. Is one the cause of the other? That’s the possibility these authors raise, but in my opinion they overstate their case; it’s possible, but there’s no reason, at this point, to think that the lack of galaxies is causing the temperature cold spot. I have read one report that the “hole” in Eridanus is a billion light years across, and another that it is a billion light years in diameter. Which is correct? Is there any estimate of its volume, i.e. considering three dimensions, if this is possible? How big is its volume compared with that of our galaxy, which I understand is about 100,000 light years in diameter, and max. 7000 thick at its centre?